The Performing Worlds event will begin on the 9th June and will continue in various locations throughout Dundee until the 15th (visit http://www.d-air.org/performing-worlds for the full programme). I will be embodying various animal personas during the week and will have a couple of situated performances as well. Last Wednesday I ran a performance workshop for the D-AiR Performance Platform assisted by the lovely and exuberant Morgan Cahn. Despite the drizzly weather we boldly left the HMC and took to the streets to explore our relationships to the city and one another. 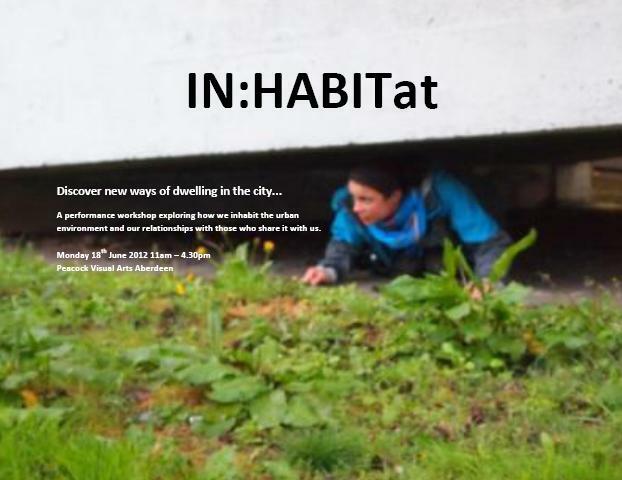 This workshop was intended to allow the participants to explore the familiar city and how they inhabit it in a new and bodily way; hopefully raising questions and bringing new insight into how we dwell in the city in our everyday lives. It also explored the way we relate to other beings in the city and what it means to share space. I was please to receive a lot of positive feedback from the group, who all seemed to enjoy themselves and who hopefully got something out of the exercise. I was extremely moved by how everyone seemed to really commit to the scenarios I proposed. I know from attending workshops in public spaces myself that it can be a little daunting to step outside the realm of ‘acceptable’ behaviour especially when there are passers by who bear witness to your actions but I was glad that no one participating felt they had been pushed too far. Here are just some of the images captured of the workshop. GENERATORprojects members show 2012 is currently open and will be until the 26th of February. It’s a great show this year; lots of high quality work which the GENERATOR team have curated very well into a nicely balanced and interesting exhibition. My piece, Gallery Cat, is a response to my recent research into animals in art and especially their presence in a gallery. This years members show reflects the boom of the animal as art medium of recent years; including a photo of a dead robin and a taxidermied rooster. The presence of the animal body in a gallery can have a very powerful effect. My piece however presents the absence of the animal. In the corner of the gallery a cat bed is placed accompanied by a food/water bowl, some toy mice and a used litter tray. White fur clings to the bed and toy mice scattered through the gallery hint at the presence of a cat but there is no cat to be seen. There were several reasons and considerations behind me exhibitiong this piece as I did (including jokey nods to Tracey Emin and Marcel Duchamp) and I want to leave these open to interpretation, however I have one particular aspect which has been on my mind that I would like to share with you. In recent years there have been many ethical concerns over artworks which have used live animals in the white cube, including the infamous Exposicion No1 by Guillermo Vargas which an internet petittion gave global coverage and debate to. As the details of the exact treatment of the dog were never confirmed it still remains a mystery as to whether the dog died or escaped, however the legacy of this piece was to open up the discussion of the ethical considerations of using other living beings in art. Since then, to some, it has become abhorrent to have a live animal in a gallery as artwork.I am interested to see what (if any) reaction the mere suggestion of a live animal may cause. In this case the animal is a cat; often imbued with human qualities of aloofness and independence, would our feelings change if the presence was that of a different animal; say a tiger, or a cow, or a rat? While at the opening for the show a woman was walking about carrying a small dog. That night the gallery held the presence of a live dog, a dead rooster and an absent cat. We have shared our homes with animals for thousands of years and although it is easy to think of the city as a purely human domain this is not the case; other species are cohabiting with us in this crowded habitat just as they always have. Some, like cats, dogs and hamsters etc, we actively chose as our companions, others, such as robins, butterflies etc, we openly invite into parks and gardens for our pleasure, while still others, rats, pigeons and bugs, are unwelcome guests in our homes and streets. So what determines our relationships with different species of animals and why are some considered ‘pets’ while others are labelled ‘pests’? Why do we engage with some species more than with others and how does this affect our relationship with them? What happens when a species crosses the boundary and is re-categorised? With these questions in mind I have begun to investigate Dundee’s animal populations. I have been lucky enough to speak to people from the Countryside Ranger service and from Dundee City Councils pest control team, all of whom have been extremely helpful in providing starting points for my explorations. In the coming weeks I intend to continue these dialogues with a view to creating artworks which open up discussion and create awareness of the diversity of life in Dundee and how we may be able to create and maintain a balance. London is full of pigeons. It is their perfect environment and they occupy the city in unnatural numbers. Like many other urban animals, pigeons exploit the protection and sustenance the city offers. There is always food to be found, in bins, on the street after bars close or directly from the human hand (sometimes shared, sometimes stolen). Natural cliff dwellers, city buildings provide the perfect nest sites for pigeons. There is plenty of space so there is little competition for the best nest sites and very few predators. Add to this the warmth and protection from adverse weather that tall buildings and human activity provides and you have the perfect habitat for pigeons. Finding myself with some free time one day I began to stalk the pigeons. I chose an individual and followed it for as long as I could. When I lost it I would choose another and follow that pigeon instead. I followed as they bobbed along, pecking at cigarette butts and chewing gum on the pavement, as they flitted from bench to branch and back again. I watched them squabble over discarded chips and limp through a forest of commuters’ legs. As I stalked the pigeons through London I realised I was moving differently to the other people in the street. They walked with purpose; fluidly and rhythmically at speed while I moved slowly, pausing, considering, stepping lightly. I viewed the city through hunters’ eyes, noticing details invisible to the rush of people around me. Aware of the sounds of birds, the smell of spices from an open window nearby and the feel of cobbles beneath my feet, my senses heightened, I moved like a cat across the city with no particular direction. Before long I was lost. It was wonderfully freeing. With no idea where I was I let my instincts lead me until I found the river and was back in familiar territory. This time meandering through the streets of London allowed me to meditate on city life and our relationships with the animals we share it with (willingly or otherwise). Dundee is of course a lot smaller than London, however its proximity to open countryside as well as the sea allows for a huge diversity of life. I began to question what exactly our relationships with other animals in the city are; how do we negotiate sharing city space with such diverse creatures? What problems arise from this close proximity? And what does it mean to be an Urban Animal?